Jack McGiffin writes again that the folks at Napoleons Casino & Restaurant in Hull are planning a big welcome for John Hesp when he comes back to play his next £10 tournament. 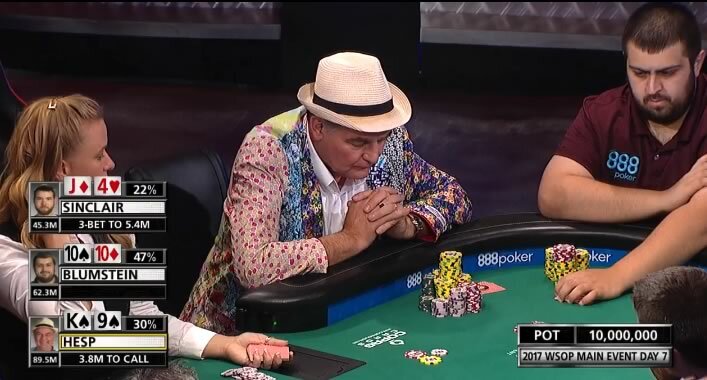 Jack says Hesp’s home casino is “planning a tournament with a large bounty” on the fourth-place WSOP Main Event finisher. Meanwhile, you can take a tour of Napoleons (courtesy of Google Maps). Is it time to organize a drive to make Hull Portland’s Sister Poker City? Results from the Summer Wildhorse series are up (though they’re not yet posted to Hendon Mob). The biggest of the six events was Saturday’s $340 buyin, which brought in 278 entries, and a prize pool of more than $84K. Congrats to friend of the blog Steve Myers who told us he’d been up for 28 hours by the time he got back to Portland on Sunday morning after a four-way deal. Overall, numbers for this year’s summer games seems a little up from last year, even with lodging at a premium. The next big thing is here! Thanks Devin Sweet for passing it on. Things quieted down significantly in big tournament action with the end of the WSOP, though some of the venues that don’t report on the day of will likely trickle results into Hendon Mob for a week or two. The biggest number showing up this week was Tommy Tran, of Everett, Washington, who made 22nd of 684 in the Planet Hollywood Goliath Grand Finale. I’ve sat in on a couple of technical run-through with the RFID table and software from videopokertable.net at Portland Meadows over the past couple of months, and last week was supposed to be a run-through with a full table of players. Haven’t heard how it went yet, but I’m crossing my fingers! The Ante Up Poker Tour World Championship at Thunder Valley has the Monolith coming up this weekend. It’s a $250K GTD $455 entry tournament with a flight on Thursday, two on Friday, and one on Saturday. Day 2 is Sunday. They have side events through the week, and a $500K GTD tournament with $1,650 buyin next weekend. Tulalip has a $10K added No Chop at the Top tournament on Sunday at 11am. $295 entry and 30-minute rounds, with first place getting 50% of the prize money and equal amounts for the next nine players. No deals allowed. Nobody else gets a cent! Assuming there were 300 players (and that about $235 of the buyin went to the prize pool), that’s be about $40K for first place and nearly $4,500 for the other nine who make the money. Of course, your chances of making the money are only about 1:30. Muckleshoot’s 5th Sunday $400 entry tournament with $3K added next Sunday. The World Poker Tour and Bicycle Casino’s Legends of Poker starts Friday with a $350 $100K GTD no rebuy/reentry 2-day tournament and a $365 Survivor (with $3K paid to the survivors), then three days of a $200K GTD with a $240 entry. Eugene’s Beach Poker Club has a $250 buyin Monster Stack at noon on Saturday, with a PLO tournament two weeks later (Saturday, 12 August) and their Crazy Pineapple tournament Sunday, 20 August. All players are in the running for bonuses in the 10 September Final Tournament. Sunday is the $20K GTD to first place at Lucky Chances south of San Francisco in Colma. $350 entry and the game starts at 9:30am. Golden Gates Casino in Colorado is scheduled to have its Colorado Poker Championship Summer, starting next Thursday. There are 25 events plus satellites over three weeks of action. 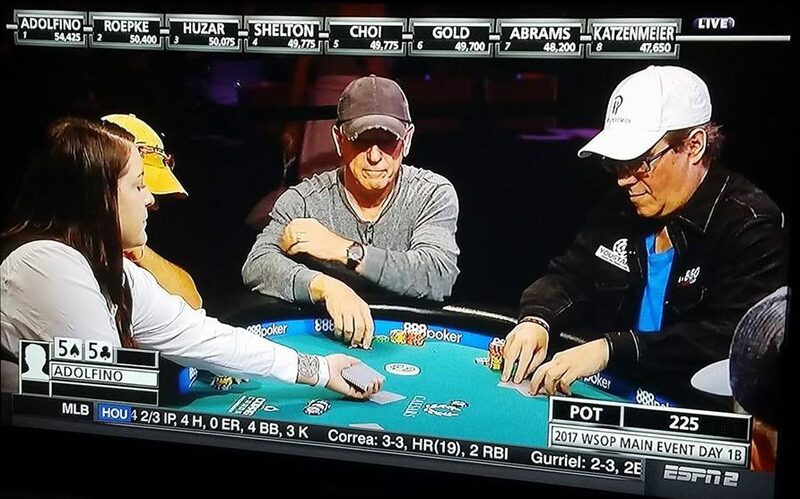 Aside from the fact that it’s great to have a guy on the World Series of Poker Main Event Final Table who’s older than I am just a couple of years after both Neil Blumenfield and Pierre Neuville (both older) made it there, it’s also satisfying that this year’s Old Guy at the Table, John Hesp is a far more likable version of British poker conviviality than last year’s WSOP “star,” William Kassouf. 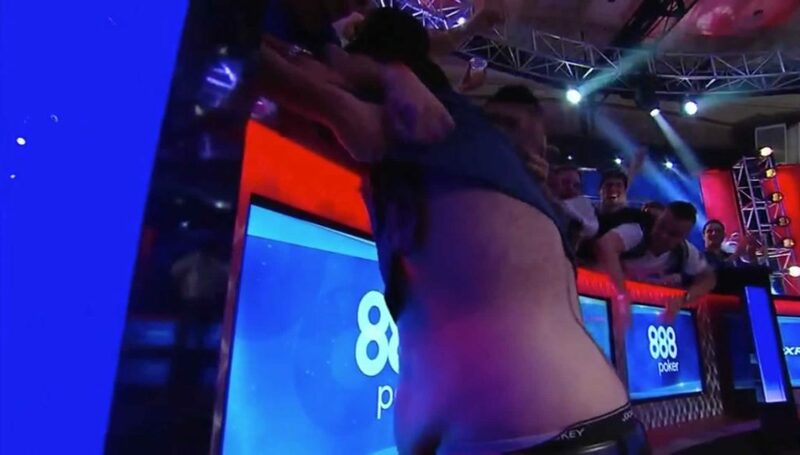 It may just have been the fact that folks already in Kassouf mode got more coverage in the poker media over the past year, but it seemed that there was more attention paid to players with verbal diarrhea. I mean, I like talking to people at the poker table — it was my primary social outlet for a while — but I’m not so much enthused with being talked at at the poker table. The fact that Kassouf had very real poker success both before and after he got so much attention on ESPN could have meant a glut of imitators. Personally, I’m hoping Hesp’s style (and deeper run, and big stack of chips) counteracts that a bit. James Weatherman from Washington was the top cash of the week for less-established players, shooting from less than $8K in recorded tournament cashes to almost $43K in one shot by placing 323rd in Event #73: $10,000 NLHE Main Event. As you might expect, one of the last Big O tournaments of the summer was won by a Portlander—Jacob Nepom—who bested 266 players in the Planet Hollywood $400 Big O Goliath Stack, the day after the 4th of July. Seattle’s Mel Elpusan has just one Hendon Mob Cash, and it’s a min-cash, but it’s from the Main Event. And Prathap Gannamaneni picked up his second recorded cash at the Venetian #92 $30K GTD $400 NLHE Bounty. Results from the Tulalip Poker Pow Wow Main Event waaaaaay back in January finally posted this week, giving players Eugene Moss and David Goodkin (both of Bellevue) and Max Young (Seaside) big bumps. Ian Johns was the last US player from Oregon, Washington, or Idaho to fall in the quest for the Final Table of the Main Event, busting out in 73rd place in Event #73. Something special brewing at The Game the next couple of weeks. Kind of wishing I had a month free to spend in Southeast Asia. The first tournament of the Wildhorse Resort & Casino Summer Poker Round Up was today at noon. You can see the schedule above for the rest of this week’s events. Down south in Sacramento, Thunder Valley hosts the Ante Up Poker Tour World Championship starting Thursday. It culminates in a $500K GTD Main Event in early August, but up first is the $160 buyin $100K GTD Catapult, with five starting flights through Saturday and Day 2 on Sunday. There are still a few days left for the Venetian Deepstack Extravaganza III. The last big event is a $600 $250K GTD tournament with starting flights Thursday through Saturday and Day 2 on Sunday. The Card Player San Diego Classic at Oceans 11 starts tomorrow with an estimated prize pool of $100K and a $250 buyin. Larry Flynt’s Grand Slam of Poker at LA’s Hustler Casino has a $777,777 GTD tournament beginning Friday. There are two daily flights (12:30pm and 5pm through Wednesday, with Day 2 next Thursday and a final day on Friday. $375 buyin. Muckleshoot’s $300 Deepstack is Sunday at noon, and there’s a 5th Sunday $400 entry tournament with $3K added next Sunday. The World Poker Tour and Bicycle Casino’s Legends of Poker runs from next Friday through the end of August. It starts with a $350 $100K GTD no rebuy/reentry 2-day tournament and a $365 Survivor (with $3K paid to the survivors), then three days of a $200K GTD with a $240 entry. Eugene’s Beach Poker Club has a $250 buyin Monster Stack at noon on 29 July, with a PLO tournament two weeks later (Saturday, 12 August) and their Crazy Pineapple tournament Sunday, 20 August. All players are in the running for bonuses in the 10 September Final Tournament. Sunday the 30th is the $20K GTD to first place at Lucky Chances south of San Francisco in Colma. $350 entry and the game starts at 9:30am. Didn’t get a chance to post yesterday—had to push a tractor up a hill, if you know what I mean (literally, I did help push a lawn tractor out of a 50′ deep ravine). But here’s where things stood when play started Sunday, Day 6 of the Main Event. One of the three remaining PNW players (and the only remainin player from the PNW US), Ian Johns, has already chipped up a bit since play began; there’s an interview with him today at PokerNews. * A Brian Valentine was 259th in chips and supposedly in the money at the end of Day 3, but he does not appear as a reported cash on the Results tab. Possibly related to this? Day 3 of the Main Event played down to the money—1,084 players—nobody from the Northwest who is not on this list cashed, but everyone on this list will cash today. 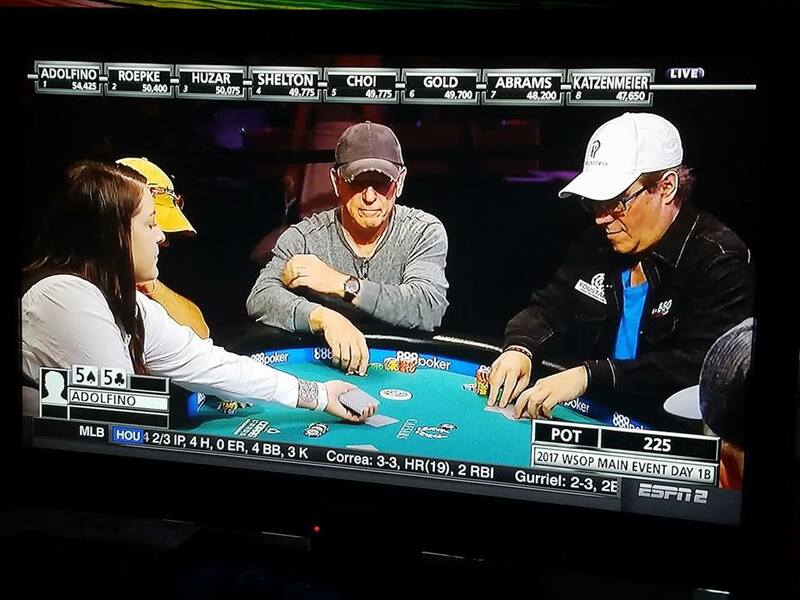 One of the things about watching World Series of Poker coverage this past month or so on PokerGo that’s been making me poker-itchy has been seeing so many of the people I worked with last year, both reporters and dealers. The reporters are mostly caught in the background in occasional shots, but the dealers are right there in all of the action, usually covered by two or three cameras on the table. I covered the mixed games as a reporter last year, the better dealers tend to work the mixed games, and they tend to be the dealers assigned to feature tables, so many of them are familiar. None of them is as well known to me as Devin Sweet, though, because there’s no need to go to Las Vegas to see her in action. 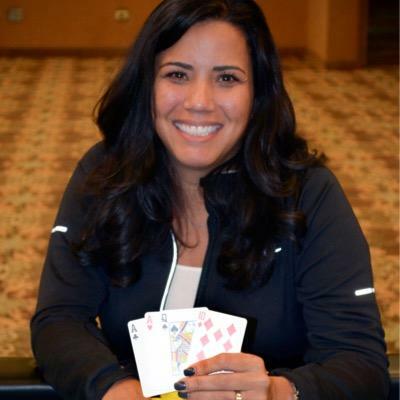 She’s been around Portland as a dealer and player (she won an event at Pendleton in 2011), she’s been involved in managing the Chinook Winds series for several years, and she was up in the early rotation for coverage of Day 1B on at the Main Event, dealing to Jamie Gold and Scott Abrams. So keep an eye out for her as the tournament plays out. 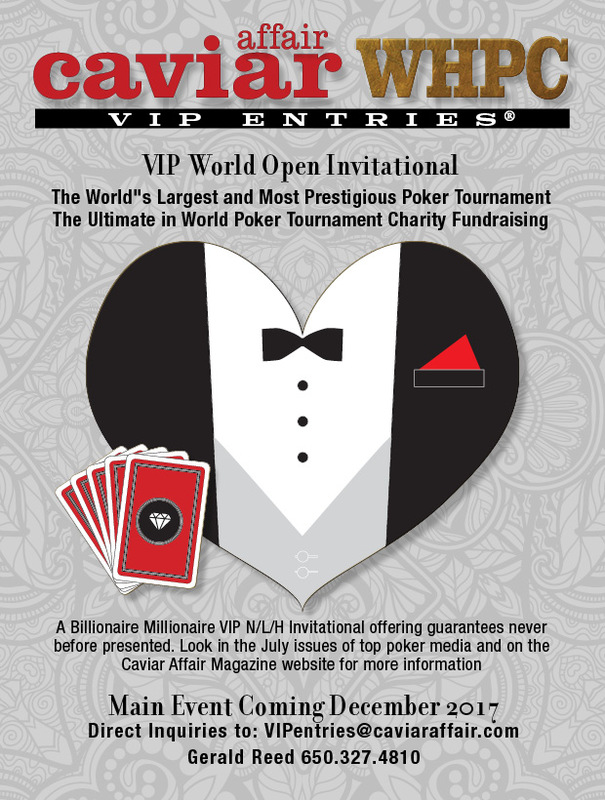 Supposedly taking place in Reno in mid-December the “Biggest Fundraiser Poker Charity Event in History” (it doesn’t mention a charity for what) sports a $1,888,888 buyin, and more than $30M for first place. I have to say, despite the fact that I do not expect anyone reading this to be planning to play it, the general vibe—not to mention the quality of the materials and the fact that social media for sponsor Caviar Affair hasn’t been active for four years—doesn’t inspire a lot of confidence. 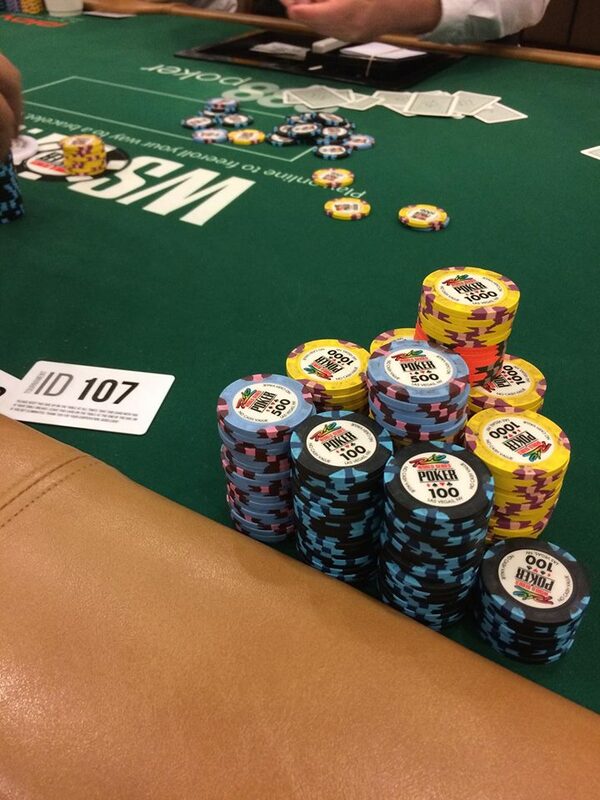 Rachel O’Neal‘s Facebook post of her stack in WSOP Event #66: $1,500 NLHE. James Tercek from Vancouver was top of the new names in this week’s Pacific Northwest Hendon Mob stats, making it to 13th place in the Ultimate Goliath at Planet Hollywood at the end of June.The $600 tournament beat the $500K GTD by nearly $160K, with $1,078 entries. Forest Grove’s Nathan Paul got his first recorded cash in a big way, taking 4th in last Saturday’s $235 Daily Deepstack at the Rio. Stevie Ackerman of Spanaway more than tripled his recorded tournament earnings by taking first in the same event. Rachel O’Neal is a Portland attorney who uses the slogan “Make Them Pay — In Spades” on her web site. She’s been playing poker for a while, but took down her first three recorded cashes on three consecutive days last week (technically). She made it to the final table of a 948-entry $235 Daily Deepstack on the 4th of July (one of two O’Neals at the final table; the other was from Georgia). On the 5th of July, she played Event #66: $1,500 NLHE, grabbing 80th place on Day 2 (6 July, but it’s recorded at Hendon Mob as the starting day). Then she apparently jumped right into the 7pm $365 Daily Deepstack Turbo, taking 44th there for a small cash. After a couple of days of no cashes (maybe she had to rest) she struck again, at the Venetian Deepstack Extravaganza Event #87 $100K GTD Bounty, for another 44th place (there were 464 entries, with a prize pool of $150K plus $93K in bounties. Late regging the 25k PLO 125k chips @ 3k and I have 10% to sell at face if anyone wants it? The elephant in the room for established players this week is Esther Taylor. There were some comments in a Facebook thread last week wondering how someone like her could be playing in the Poker Players Championship. I’ve never met her at the table (or anywhere else) before working at the WSOP last summer, and all I can say is she seemed to be shooting me suspicious looks whenever I was reporting on her tables. She’s had a pretty good summer, though, making three final tables before the 4th of July, as well as four other cashes. 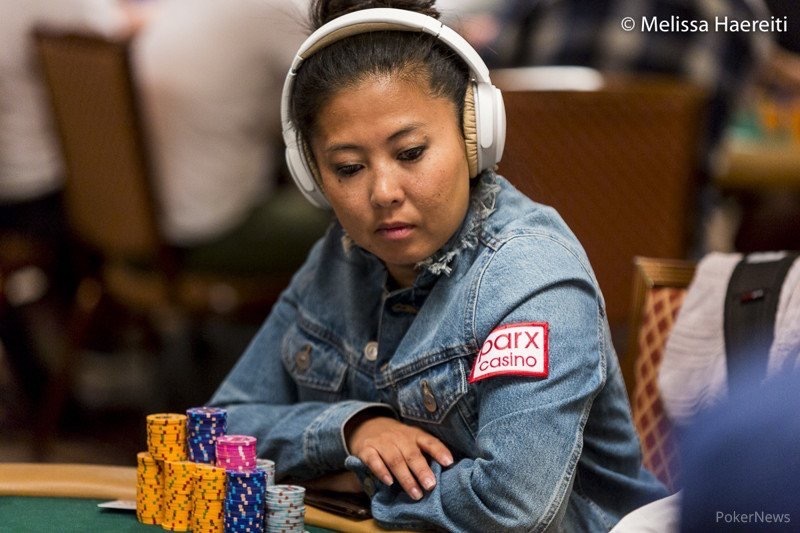 Then, the day after the 4th, she got to the final table of Event #67: $25,000 PLO8 High Roller, and finished in 3rd place, a cash that was more than half the size of her previous recorded earnings and which jumps her over 4 players on the Hendon Mob’s Oregon leaderboard. With Taylor no longer actually living in Vancouver (so I’ve hears), James Romero moved to Vegas, and Annie Duke somewhere else (who cares? ), Seth Davies (in 4th place on the Oregon leaderboard) is now the top-ranked player on the state leaderboard who actually lives here. By the way, just before she late-regged the PLO tournament, Taylor took 4th place in Event #64: $1,500 NLHE/PLO 8-Max for a 5600% ROI. Speaking of the PPC, Washington’s Ian Johns has almost doubled the number of cashes he had last year—though 2016’s four cashes included 2 bracelets. He hasn’t seen any final tables this year, but he’s come close all seven times, finishing between 18th and 17th on two cashes and between 10th and 12th on the other five. Last week it was 10th place in Event #62: $50,000 Poker Players Championship 6-Max. Vi Do of Bellingham played the Venetian Event #76 $1,100 NLHE Bounty, taking 4th place. Regular schedules so far as I’m aware. The Heartland Poker Tour at Golden Gates Casino in Colorado had the first flight of its Main Event today, there are three more. You can get a one-way ticket to Denver for Friday morning for less then $200! It’s gold! 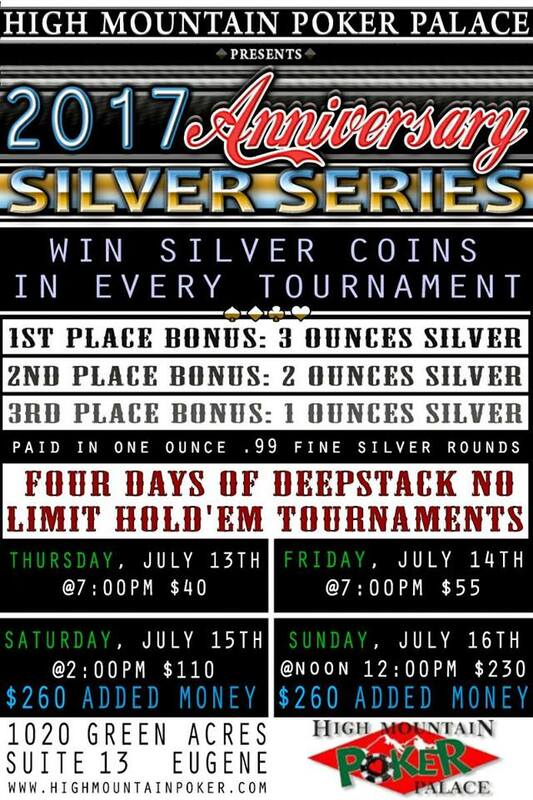 Well, actually it’s silver and Eugene’s High Mountain Poker Palace has a four-tournament has their 2017 Anniversary Silver Series with games ranging from $40 to $230, with $260 in added money, and silver coins for the top three finishers in each tournament. If you’re planning to drive from out of town, you might want to call and make sure there’s room. It could be a big crowd for the space, which was quite nice the time I made it down. Up in Calgary, there are daily C$225 “Wild Card Rounds” at 6:30pm and at noon on Friday and Saturday. 1 in 5 players get entry to Sunday’s Silver Buckle Showdown at the Deerfoot Inn & Casino. You can also buy into the Showdown for C$1,000, you get 25K in chips and play 30-minute levels. Tickets to Calgary, though, are almost $400 one-way, and that’s US dollars. Larry Flynt’s Grand Slam of Poker starts tomorrow at LA’s Hustler Casino. It features a $200K GTD kickoff event ($250 buyin). The Main Event is $375 and has a GTD of $777,777. Non-stop one-way flights to LAX for $120 Saturday morning. Muckleshoot’s $200 Big Bounty is Sunday at noon, 23 July is a $300 Deepstack, and there’s a 5th Sunday $400 entry tournament with $3K added. Save your summer in luxury with the Bellagio Cup XIII, a 5-day $10,400 buyin starting Friday. $1,090 satellites, turbo and hyper turbo satellites run from tomorrow through Sunday (Day 3 of the Cup) for entries into the Cup. Next Wednesday, close to home at the Wildhorse Resort & Casino Summer Poker Round-Up, there are six events (plus satellites), the largest of which has a buyin of $340. As mentioned last week, accommodations are sparse and expensive due to a motorcycle get-together. Down south in Sacramento, Thunder Valley hosts the Ante Up Poker Tour World Championship starting 20 July, which culminates in a $500K GTD Main Event in early August. If the nice summer in Portland isn’t hot enough for you yet, the Card Player San Diego Classic at Oceans 11 has a $250 entry fee and three starting days (two flights each day) next week, with the final day on Sunday. You could get to San Diego airport with an hour to get to Oceanside before the first Saturday flight for about $200 if you buy your ticket now. Don’t know how you’ll get back. The last day of the World Series of Poker Main Event is 22 July. The tournament playes every day until then except for a two-day break on 18 & 19 July once the final table has been finalized. Daily Deepstacks run through 17 July (the last day before the Main Event final table). If you’re down in Las Vegas because you want to breathe in the excitement of the big money, the Venetian Deepstack Extravaganza is running through 23 July. Monday and Tuesday are starting days for their Event #103: CardPlayer Poker Tour $2M GTD $5,000 NLHE Main Event, and there are a number of other tournaments there, as well as the rest of the regular Vegas schedule. Happy hunting! Another week with a lot going on (duh), so the Planner will once again be coming out this evening. Poker media megastar Angela Jordison mentioned on Facebook today that Andrew Brokos of the Thinking Poker podcast briefly analyzed a hand from their faceoff in a $1,500 PLO8 tournament at the World Series of Poker on the most recent edition of the podcast. Check it out! You should also go back and hear her interview with Brokos and Nate Meyvis from just after she won three tournament in a row in Pendleton in 2015. Esther Taylor at the final table of WSOP Event #64: $1,500 NLHE/PLO 8-Max. She took 4th place this evening. The top three new names on the leaderboard this week are all from Oregon. Jason James of McMinnville bagged a respectable first-ever Hendon Mob result by taking 69th place in Event #47: $1,500 NLHE Monster Stack. There were 6,716 entries in the tournament, so James just missed being in the top 1%. Portland’s Justin Dye made the final table at a Golden Nugget Grand Poker Series $100K GTD. The result looks like there was a nine-way deal, with the players all making between $8K and $18K. Dye took 7th place in the tournament, which more than doubled the guarantee with 1,944 entries at $150. Kevin Nelson of Springfield got through 1,012 other entries to make it to 4th place in a WSOP $235 Daily Deepstack on 29 June. (If you’re looking for other 2017 Daily Deepstack results, look here). Scott Clements won more than a quarter of a million dollars to extend his lead as Washington State’s leading tournament winner after coming into the final table as the chip leader of Event #54: $10,000 PLO 8-Max Championship. Clements took fourth place, losing to Tommy Le, who placed 3rd in the same event last year and 2nd in the $25K PLO High Roller. Lee Watkinson from Washington made the final table of Event #58: $1,500 NLHE. There were 1,763 entries. The Golden Nugget Grand Poker Series Main Event was a $500K GTD tournament with a $570 buyin and more than two thousand entries. The prize pool pushed over a million dollars, and Portland’s Sai Ram Sirandas got fifth place. Nick Stowall of Portland has had a pretty good week. He cashed at 208th in Event #52: $1,500 NLHE and 207th in Event #58: $1,500 NLHE, then made it up to 33rd in Event #60: $888 Crazy Eights NLHE 8-Handed and 43rd in Event #65: $1,000 NLHE. Federal Way’s Kate Hoang made the final table of Event #51: $10,000 PLO8 Championship (and she cashed in Event #64: $1,500 NLHE/PLO on Monday). Darren Rabinowitz (now living in Las Vegas) cashed in Event #61: $3,333 WSOP.com ONLINE NLHE High Roller in 5th place. The biggest (so far) online event at the WSOP was won by 2015 November Niner Thomas Cannulli, and drew 424 entries. Bonnie Rossi (also of Federal Way) got to the final table of Event #57: $2,500 Omaha Hi-Lo/Seven Card Stud Hi-Lo, a tournament that had 405 entries. Also among the limit games, Grant Pass’s Scott Mayfield took 8th place in Event #53: $3,000 LHE 6-Max. Back outside of the Rio, Richard Forrest from Eugene played the Aria Classic Seniors NLHE. Six of the last seven players (including Forrest) took an even payout with the first-place player winning almost double that. And last but not least (there are a lot of other players with cashes in the summer), Washington’s Kenneth Burnsed got fourth place in a WSOP $235 Daily Deepstack last week. It’s the first weekend of the month, so this is the First Friday at Final Table. It’s time for a $20K GTD tournament, with the usual $80 buyin and live rebuy, and a $40 addon. I miss the days when I had more special events to mention here. The WSOP Main Event starts this weekend and most of the other series in Las Vegas are winding down. The CardPlayer Poker Tour at the Bicycle Casino in Los Angeles is in the middle of its run. This Thursday the last two flights of a $100K GTD with $150 buyin take place and the game ends tomorrow. Saturday through Wednesday are $245 flights for their $400K GTD main event. Day 2 is next Thursday with the final day on Friday the 14th. The Heartland Poker Tour returns to Golden Gates Casino in Colorado a week from tomorrow. The Main Event begins 12 July. There are four side events and many satellites before the Main. The HPT is no longer televising their events, but there will be a live stream of the final table on 17 July. Up in Calgary, there are daily C$225 “Wild Card Rounds” at 6:30pm and at noon on Friday, Saturday, and Sunday this weekend and Friday and Saturday next week. 1 in 5 players get entry to the 16 July Silver Buckle Showdown at the Deerfoot Inn & Casino. You can also buy into the Showdown for C$1,000, you get 25K in chips and play 30-minute levels. Muckleshoot’s Monthly Special is Sunday at noon. It’s a $250 buyin for 15K in chips. Next Sunday (18 July) is the $200 Big Bounty, 23 July is a $300 Deepstack, and there’s a 5th Sunday $400 entry tournament with $3K added. Larry Flynt’s Grand Slam of Poker starts next Thursday at LA’s Hustler Casino. It features a $200K GTD kickoff event ($250 buyin). The Main Event is $375 and has a GTD of $777,777. A last-minute entry in the Las Vegas tournament summer is the Bellagio Cup XIII, a 5-day $10,400 buyin starting 14 July. $1,090 satellites, turbo and hyper turbo satellites run from 13 July through 16 July (Day 3 of the Cup) for entries into the Cup. It (relatively) close to homeat the Wildhorse Resort & Casino Summer Poker Round-Up.There are six events, the largest of which has a buyin of $340. As mentioned last week, accommodations are sparse and expensive due to a motorcycle get-together. The Planner is going to be a little late this week; spent too much of my 4th of July loooking for an eclipse-viewing spot, moving a mattress, and binge re-watching Justified.